Hypertext Markup Language. What is it for the mobile world? On its most rudimentary level, it’s a universal, “device-agnostic” language used for developing experiences within the browser. It’s cost-effective and universally recognized. However, some people see HTML 5 as the inferior sibling of apps – the kid who will always play catch-up, but never reach or surpass his brother. Others see HTML 5 as a clear winner – the stable solution with a long-term edge over rampant mobile app development. So which of these two ideas holds true? At Onswipe, we strongly believe that HTML5 embodies the future for developers. Let’s take a close look at the benefits it provides as well as the statistics behind this push for universality. Financial Accessibility: HTML 5 allows developers to provide an app-like experience within the browser, without requiring users to actually download an app. This significantly mitigates costs for a company, and apps typically pose more barriers to entry. Universality: HTML5 is device-blind – that is, it was not built for a specific piece of hardware, but rather as a common language for the entire world wide web. Openness: There is no gatekeeper. In other words, no single company is able to exert influence on HTML5 updates or require purchases for their in-browser experiences. Expertise: An iOS developer is much harder to find and more costly to hire than, say, a traditional software engineer. 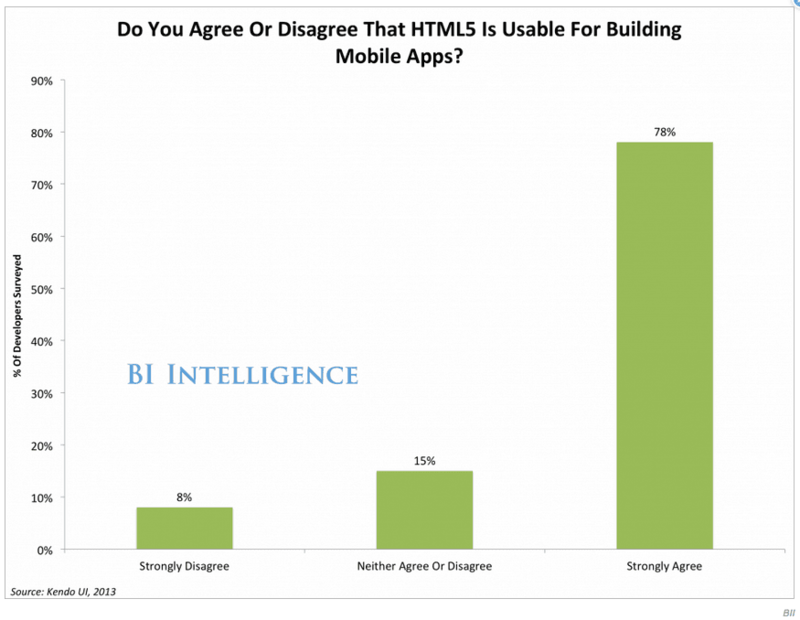 Interestingly enough, 78% of people agree that HTML5 is usable for building mobile apps. With this many developers believing in HTML5′s ability to produce solid mobile experiences, there’s a bright prospect for the future of HTML5. While the potential of HTML5 may not be as great as apps for media-heavy or extensively interactive mobile experiences, it seems to be a plausible solution for most businesses. In addition, BI Intelligence reports that nearly 90% of developers claim to be VERY interested in building for the HTML5 mobile web and other platforms. Now that we’ve established that there is a strong demand for building for the HTML5 mobile web, let’s move on to a more compelling question: what kinds of software are these developers looking to build? 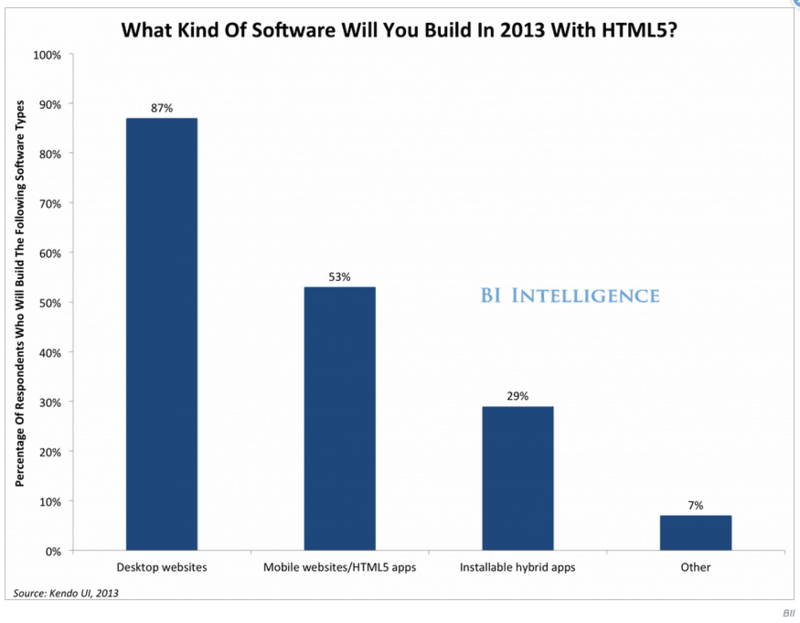 It turns out that 87% of developers are looking to use HTML5 for building desktop sites on the mobile browser. This is because the costs associated with in-app development are astronomical compared to developing with HTML5. Here at Onswipe, we’ve committed ourselves to the prospect of HTML5. We’ve successfully woven it into the mobile browser for a seamless, app-like feel. Publishers who have partnered with Onswipe reap the benefits of increased time spent on site as well as pages per visit. They spare themselves of grueling app development costs, and since publishers typically don’t require graphically demanding interfaces, HTML5 is more than sufficient for an engaging experience. The numbers we’ve stated demonstrate that although HTML5 might not necessarily be a silver bullet that alleviates all headaches associated with app creation, it certainly eliminates a lot of them. And for publishers, this means HTML5 is a cost-effective alternative to apps for mobile development. What are your thoughts about using HTML5 for the mobile experience? Let us know on Facebook, Twitter, and Linkedin, and while you’re at it, don’t forget to like & follow our pages for awesome updates!